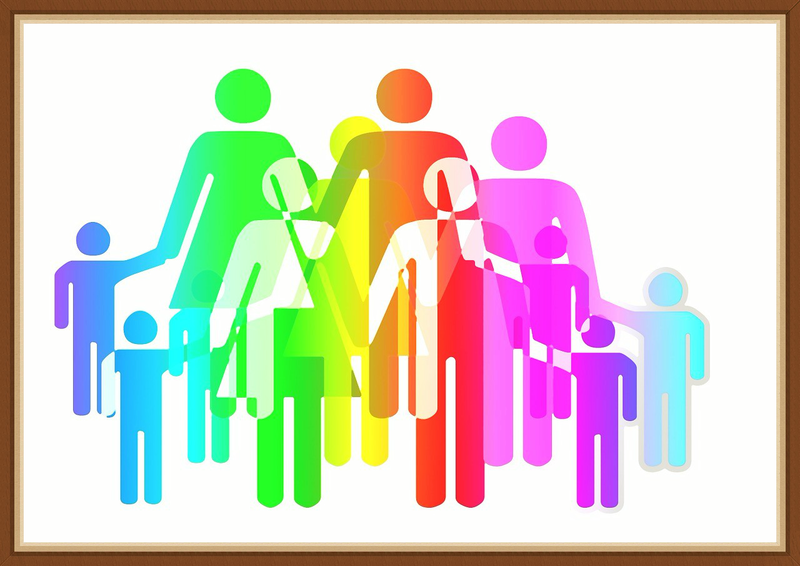 Week 37 (September 10-16) –Feature an ancestor who had a large family or who was a member of a large family. This week's ancestor was born into a large family and then later had a large family of her own. She's from my maternal side of the family on my Whitney branch. She's my 1st cousin 3x removed Margaret E Whitney Green. Margeret E Whitney was the oldest daughter of my 2nd great grand uncle, Augustus Whitney and his first wife, Susan Ann Burns. Here's how Margaret and I are connected. Margaret was born on December 31, 1866 in a part of Hyde County, NC called Lake Comfort. She was the oldest in a family of ten children. Well, actually eleven (One of her sisters died in childhood.) Now to me ten is a lot but for Margaret, that was all she ever knew. In fact, ten probably felt like just the right number because she would go onto have ten children of her own. 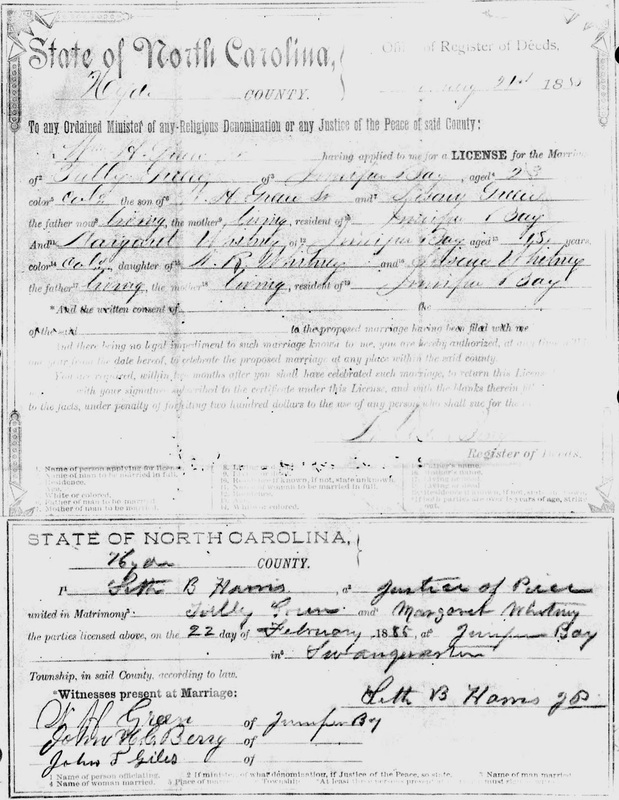 She married Tully Green on February 22, 1885. Tully and his family were from the same area as the Whitney clan. The couple raised a family. The names of their 10 children were Augustus, Etta, Tully jr., Carrie, Mckinley, Nellie, Milton, James, Randolph and Pearl. Margaret and Tully did not own their own land. From what I can tell from looking at the censuses, Tully sharecropped and Margaret worked as a laundress. They lived in Swan Quarter, Hyde County in 1900 but moved to Oriental, Pamlico County by 1910. Tully Green died December 18, 1915, leaving Margaret to care for the family. It could not have been easy with six children still living at home and by 1920 the addition of a grandchild. At some point after the death of her husband, Margaret and her family moved to 12 Elm St in New Bern, NC. It looks like everyone in the household who could pitch in and find work did so. Margaret and her daughter Etta worked as laundresses. Her daughter Nellie worked as private nurse while her son worked as a laborer at the tall shipyard. I bet her sons James and Randolph did whatever they could around the house to help their mother, even if it was just watching out for their baby sister Pearl or niece Esther. 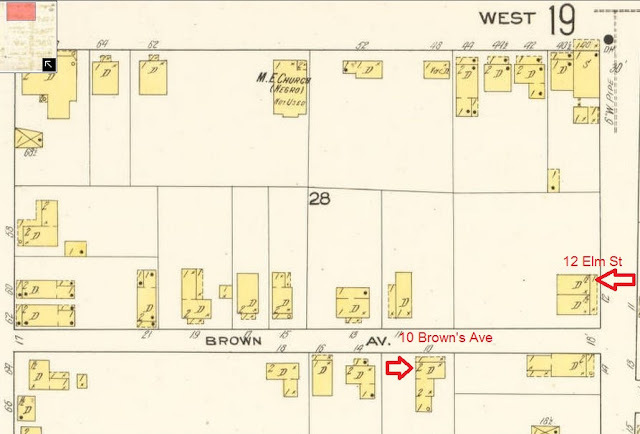 The address 12 Elm St intrigued me because I immediately knew what neighborhood the family was living in during this time. 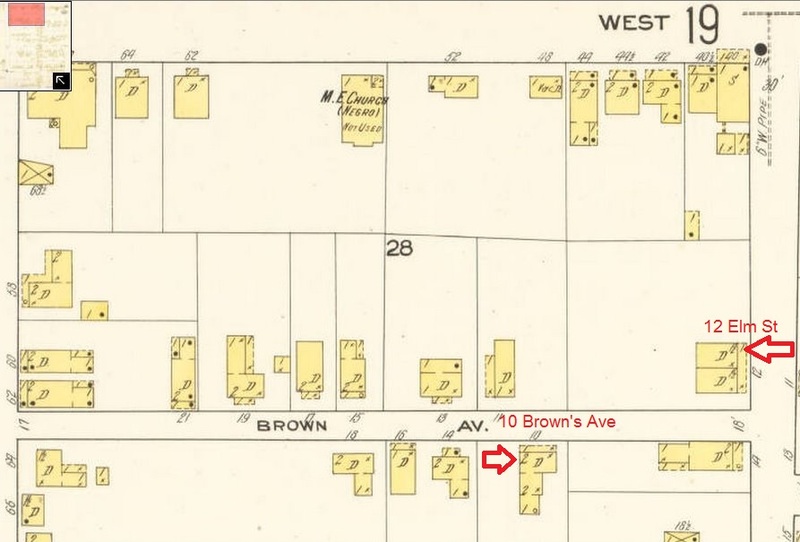 Here's an old Sanborn Map of New Bern from 1913 where I labeled the locations of 12 Elm St was located and 10 Browns Ave. My 2nd great grandparents Samuel and Sarah Whitney resided at 10 Browns Ave and then later my great grandparents John and Carrie Harrison. 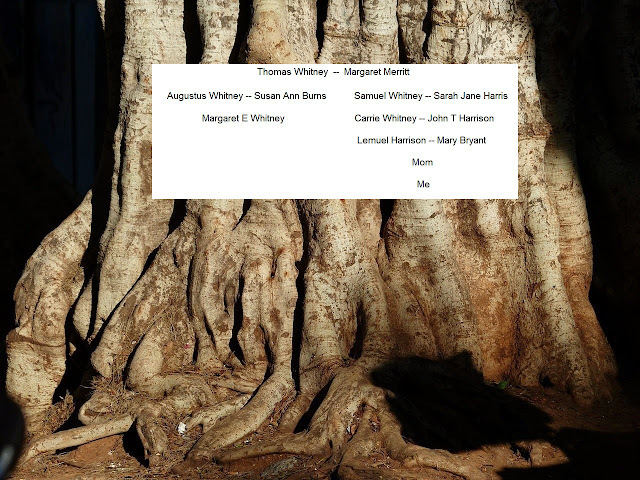 Samuel Whitney was Margaret Whitney Green's uncle. Samuel's brother/Margaret's father, Augustus Whitney died in 1908. Perhaps Margaret moved to New Bern to receive help from Samuel and his family. Or perhaps my 2nd great grandmother Sarah Whitney who became a widow herself in 1916 and Margaret leaned on one another for support during this time. Shucks, they definitely lived close enough together for this to be the case. 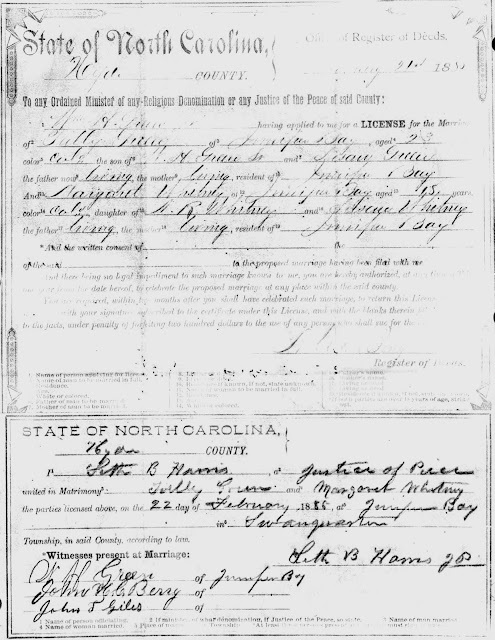 Margaret E Whitney Green moved to Pamlico County, NC by 1930. She remained in this county for the duration of her life and died on June 4, 1946 from a cerebral hemmorhage. She's buried at St Stephen's Church Cemetery in Oriental, NC. I love this small story of her life! I bet everyone who could, did get work. They may even have run errands or something. Everyone did what they could to help. That's what families do. Thanks Kristin! Loved how you use the Sanborn maps in your research. I have been following your 52 ancestors series as you research the people so nicely.